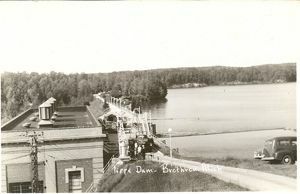 Historical postcard photo of Tippy Dam. Thanks to Don Harrison. Last week’s rain and high water has come and gone, but not the stain or the fish that entered the local rivers. The Manistee River continues to have a good number of fish in it from the lake to the dam with new fish continuing to enter as we have had a nice, wet fall. Typical of steelhead, once you think you have them figured out, they change not only where they are sitting but also what they are eating. Because of the stain, look for fish to respond to larger and brighter egg flies than what you would normally fish this time of year. The water close to the dam is still producing good numbers of healthy, robust brown trout on both nymphs and streamers. If targeting the trout, do so with a 6-weight, so you have a chance at landing a steelhead that very well could eat your fly. Hang on. 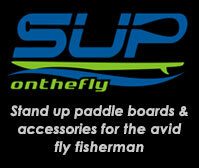 Water temps are hanging on in the mid-40s and the forecast weather should keep things there for a little while. The Betsie River has a nice color to it and fish are throughout the river. Fish have been coming on egg flies with Oregon Cheese being the most predictable color. Mix up your colors and be sure to fish two eggs as there are lots of ‘salmon berries’ floating down the river right now. There seems to be a better than normal number of resident brown trout in the river this fall – perhaps due to the cool summer. Regardless, they are a nice interruption between casts while fishing for steelhead. The Platte River has a few steelhead in it and still a stray salmon or two. Cover lots of water, fish fast and enjoy this crystal clear water – take your fluorocarbon tippets and best presentation for success. The Boardman River is open from the lake to Sabin Dam with some salmon scattered throughout and some silver steelhead in the mix. Most of the steelhead are skippers and look for the bigger adults to show up in larger numbers shortly. The Upper Manistee River is all yours to discover right now with practically no fishing pressure. Its time to feed those big browns a meal now that they are in post-spawn mode and are looking to put on some weight before the pending winter. Big to medium sized streamers fished slowly and with some weighted eyes or a cone will give that presentation the wiggling and jiggling motion that they like to eat. If that doesn’t work, fish a baitfish pattern. Change your presentation and patterns until you lock onto what the fish want. Good luck!